Over at the Talk.Origins Archive Quote Mine Project, there’s a brief discussion of a quotation supposedly from Darwin: “Not one change of species into another is on record … we cannot prove that a single species has been changed,” credited to My Life and Letters. Mike Hopkins and Mark VandeWettering correctly observe that Darwin never wrote such a book—although there is a book, assembled by his son Francis Darwin, with the similar title The Life and Letters of Charles Darwin (1887). They also correctly observe that the quotation appears on a plethora of creationist websites, to which I’ll add that it appears in a plethora of creationist books as well, the most recent of which (excluding self-published books) seems to be Robert Jeffress’s Outrageous Truths: 7 Absolutes You Can Still Believe (2008). (The sixth of the title’s purported truths is that evolution is a myth.) And they correctly observe that the second half of the quotation actually appears in The Life and Letters of Charles Darwin, although the words aren’t Darwin’s. Here’s the explanation. On May 21, 1863, the botanist George Bentham (1800–1884), who had been discussing the origin of species with Darwin in preparation for a talk he would give later in the year to the Linnean Society, of which he was then president, wrote to Darwin to ask him why, on his theory, certain species appeared to remain unchanged for a long time. 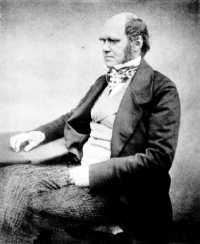 In his May 22, 1863, reply, Darwin agreed that Bentham had identified a problem, but urged him, in a postscript, to remember that the argument for natural selection “must at present be grounded entirely on general considerations” because “[w]hen we descend to details, we can prove that no one species has changed; nor can we prove that the supposed changes are beneficial, which is the groundwork of the theory.” Before the semicolon, Francis Darwin editorially inserted a gloss in square brackets: “[i.e. we cannot prove that a single species has changed. ]” So the actual words of the second half of the quotation aren’t Darwin’s, although the sentiment is. I might mention that although the general considerations that Darwin adduced for accepting natural selection—“… its being a vera causa, from the struggle for existence; & the certain geological fact that species do somehow change … analogy of change under domestication by man’s selection. … & … connecting under an intelligible point of view a host of facts”—remain valid, there is now abundant particular evidence, of the sort that he must have hoped for when he wrote “at present.” That extends even to observed cases of speciation in the laboratory and in the field, something that I suspect Darwin would not have even dared hope for. (Partly for that reason but mainly to accommodate the need for rapid diversification after Noah’s Flood, a significant number of young-earth creationists now accept speciation by natural selection—while still drawing the line at evolution between Biblical kinds.) So citing Darwin on the absence of observed cases of speciation is just a way of ignoring 150 years of further scientific research. The emphasized phrases, of course, are the second and first elements, respectively, of the quotation discussed by the Quote Mine Project. The passage became immediately popular in antievolution circles, appearing in Arthur I. Brown’s Evolution and the Bible (1922) and Philip Mauro’s Evolution at the Bar (1922). But, given that only the second element (the first emphasized phrase) occurs in the Life and Letters, what’s the source of the rest of the material in the pseudo-Darwin quotation? I’ll try to answer in part 2.